Saltrock began in the 1980s, when brothers Angus and Ross Thompson arrived in London and headed straight for the Cornwall coast. They salvaged a load of gear including nails, tape and a Salvation Army rug and began printing original surf-inspired designs on t-shirts and selling them from the back of their Austin Allegro. They soon moved from Penzance to North Devon and became a huge part of the surfing community. National and international recognition soon followed and today Saltrock is better known as Saltrock Surfwear, and still run by the same creative team with the same ethos, but now to customers the world over. The name Saltrock comes from the brothers’ favourite surf break in their home of South Africa and their irrepressible range gets you closer to the surf wherever you are. Their range of clothes and accessories for men, women and kids embodies the surfing lifestyle the brothers are still in love with to this day. How do I use my Saltrock discount code? The Saltrock Surfwear ‘sale’ selection has a range of clothes and accessories at even better prices. But be quick, they are never around for long! Is there a Saltrock Surfwear near me? Find your nearest Saltrock store here. Is there a student discount at Saltrock Surfwear? Yes! Saltrock Surfwear do a 20% discount for students, you can find it on their homepage. Is there a Saltrock Surfwear outlet store? Yes! It’s in the Swindon Designer outlet. Delivery is ‎£3.95 by Royal Mail. Expected time 4 - 5 working days. £4.99 Next Day Delivery available for orders placed before 5pm weekdays. Delivery free on orders over ‎£30. If you’re not happy with your purchase, Saltrock will refund or exchange your goods. Just send them back in their original packaging with a returns form within 14 days of delivery. 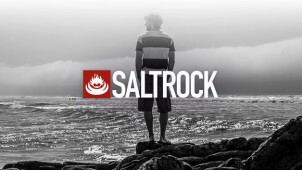 Saltrock Surfwear is one of the best brands out there to offer practical surfwear in great style. Their comfortable, practical and stylish surf-inspired range is perfect for outdoor adventures, whilst allowing you to bring your love of surf indoors. A Saltrock promo code could have you looking good for less. From lined hoodies to chunky knits and soft trousers, the Saltrock Surfwear range gets you closer to the surf wherever you are. On top of their extensive clothes range, Saltrock Surfwear has all the accessories you need to get everything out of that beach trip. Saltrock Surfwear's bodyboard range means you can find the perfect board to ride the surf, and their gorgeous skimboards will have you cruising the sand in effortless style. Back on land, you can dry off with one of their exclusive tees, and get warm in a range of knitwear. Looking for men’s t-shirts? Saltrock Surfwear is the perfect place to go for those who enjoy the outdoor life and those who love the lifestyle. Our Saltrock discount codes mean you could save money whilst shopping for that perfect tee. Check out their excellent own-design range, all about merging beach vibes and outdoor adventure. With an extensive range of artful photographs and graphics on their shirts, you’ll definitely make a statement with a Saltrock Surfwear tee.